Five Utah trails for the mountain-biking badass in you. A certain red-hued mountain-biking trail down south might be Utah’s most famous, but the rest of the state has plenty of options for two-wheeled summer fun. Here are five trails from across the state for after-work or weekend adventure, in the city, forest and—of course—on the slickrock. A milder alternative to Slickrock Trail, Gooseberry Mesa is a nice mix of technical areas, with a scenic 10-mile loop that’s more pleasurable than grueling. The flattish trail mixes slickrock with dirt paths as it meanders through junipers, pinions and ponderosas, with views of the red-rock vistas. Gooseberry Mesa is especially popular with Zion National Park visitors, as there is very limited bikeable terrain inside Zion itself. It may not be easy, but it’s certainly historic. This difficult 12-mile-round-trip ride through the trees takes you past the steam engine from a 19th-century logging mill—perhaps you’ll stumble upon the gold that’s rumored to have been stashed by bandits after a stagecoach heist. If natural scenery is more your thing, it’s here in spades. Big game roam the woods, and the lake itself is a nice reward for the rocky terrain you’ve just conquered. As Steam Mill is at a high elevation, give it until June to attempt. The most iconic biking area in Utah includes a climatic perk: You’ll never have to wait for snow to melt to get the full experience. 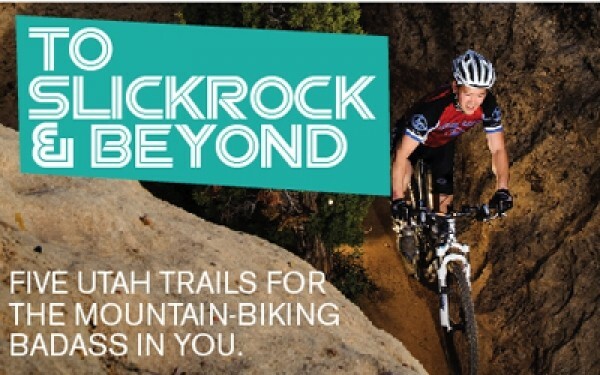 Slickrock, comprised of sandstone that is actually quite firm and grippy when it’s dry, is best experienced with a decent bike that can handle the rigors of a 100 percent rock trail. The trail is best suited for veteran bikers, but most anyone with some experience can have a good time, walk their bike when the going gets tough and enjoy stunning views of canyon country. There’s no better way to exorcise the stress of the workday than by heading out for an evening ride overlooking the Salt Lake Valley. To stick exclusively to dirt, put in at the mouth of Emigration Canyon or where Memory Grove meets City Creek Canyon. Civilization has steadily encroached on the trail, but there’s still a lot of fun stuff along the way, like a few old lime kilns and the famous Bobsled trail, which speeds down into the Avenues neighborhood, where you can return to the trailhead in City Creek Canyon. This isn’t a very technical ride, but it’s a good workout with a decent amount of up and down. The “Backbone of Utah” delivers vistas on both sides of the rim, allowing riders to gaze into Park City and Big Cottonwood Canyon. This single-track ride is normally accessed at Guardsman Pass, and there’s a shuttle on even-numbered days that takes you to the trailhead from the mouth of Millcreek Canyon. Nothing is quite as uninviting as Puke Hill, the toughest climb on the trail, so don’t feel down if you have to walk that areaÂ­—it’s not uncommon. The downside to the Wasatch Crest Trail being above it all is that it’s also above the snowline—you won’t be able to give it a shot until July.